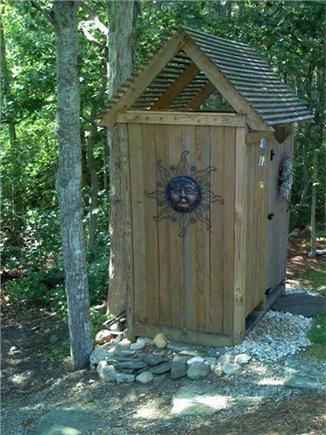 Nature's best private outdoor shower! Falmouth Center is a short drive away and features a beautiful village green, with quaint shops, restaurants, and a weekly farmers market. 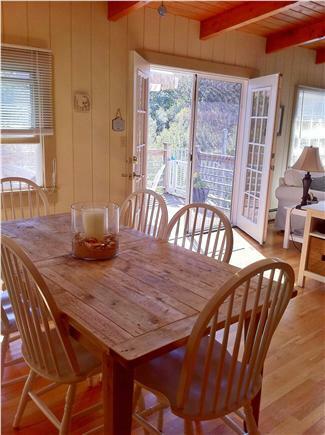 In the evenings come home to listen to the ocean while relaxing on the upper dining deck. At our home you will love the ''upside-down'' layout. The first floor begins with a large two story entry, a wood paneled den, the first of two queen bedrooms, and a master bedroom with king bed and flat-screen TV, vaulted ceiling and stone fireplace. The queen bedroom also has a generous twin sized chair-bed. A large, recently re-done bathroom is also on this level. 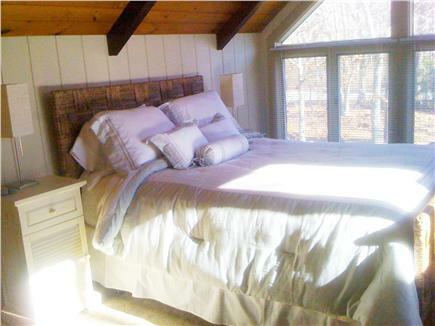 Each of the bedrooms and den enjoys private access to a large deck, perfect for entertaining. Steps away is an outdoor shower. The 3 regular bedrooms sleep six, plus the fold out twin, the daybed in the den that opens to a double, and the living room sofa opens for more overflow sleeping for a total of 11. Plus, that isn't counting the two small lofts in the king bedroom. As you walk up the stairs, a bedroom suite with private bath and the second queen bed is on your left, then continue to the second floor. This large space is perfect for family and friends to enjoy together. The dining area seats 8 and is open to the living room space and kitchen. The brand new custom gourmet kitchen is equipped with top quality appliances including a large, six burner range. The living room seating area features a fireplace, comfortable seating, a large flat-screen TV, and double french doors leading to the upper dining deck. A spiral staircase between upper and lower decks completes the fun! You may not want to leave private Racing Beach, but many others are just minutes away including Wood Neck, Old Silver, Chapoquoit, and Surf Drive beaches. Or drive just 4 miles and catch the ferry to Martha's Vineyard for the day. Additional pricing info: 10% discount on additional continuous weeks after week 1!, State and local taxes of 12.45% will apply. I'm originally from Falmouth and come back yearly. I've rented numerous homes in many locations over the years, but this house is far and away the best experience I've ever had. 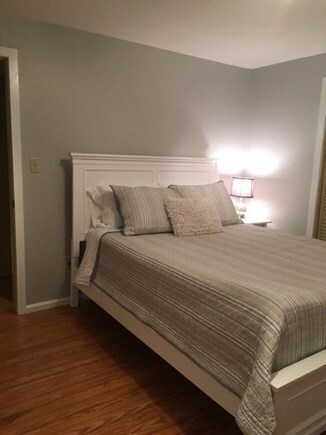 Spacious, clean, quiet, centrally located, impeccably decorated...I just can't say enough. Jim was an excellent host from start to finish. From the ability to access a private beach to the option of entertaining a family for a cook out, this place has it all. There is no better option! 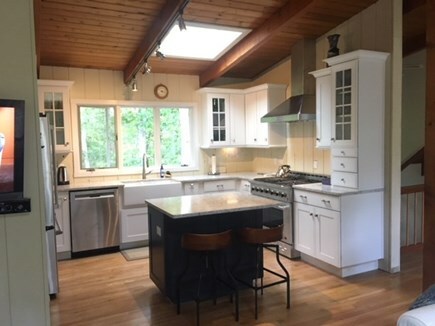 I've been renting on the Cape for several years now and nothing compared to this house. 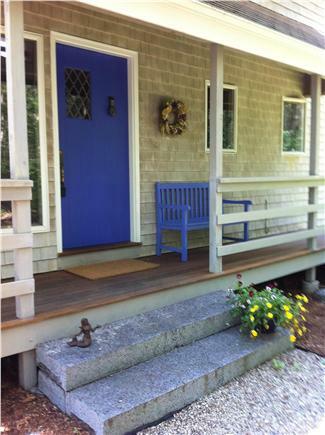 Wonderful location, totally private, near the towns of Falmouth and Woods Hole. The house is so nicely furnished. All needs are met here.....clean, full kitchen with all you need, bath and beach towels very well stocked, beach chairs, bicycles. 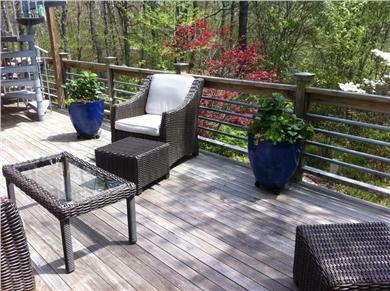 Upper and lower deck , great for outdoor dining and relaxing. Great outdoor shower! The beach, which is a short and lovely walk from the house is in a word... perfect. We were lucky to have wonderful weather and all the hydrangea bushes were in full bloom. We had a fabulous week. My family has been renting in Falmouth almost every year for the past 10 years. We get about one week a year to disconnect, spend time together and recharge. Choosing this home to do so in was the best decision we could have made. I cannot express enough how wonderful this home is, or the owner, Jim, for that matter. We arrived to find a wonderful gift basket from Jim with all the information about the house and area you could possibly need. The house itself is absolutely gorgeous, spotless, and laid out in such a way that you can spread out...be together but not, TOO together, all week. 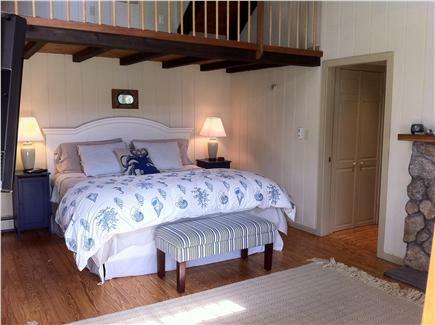 The home is decorated impeccably...clean, cozy, and with an oceanside feel. The inverted set up is fantastic...loved having half the bedrooms on the first level...the other on the second. My 15 year old daughter and her friend had privacy, as did we. 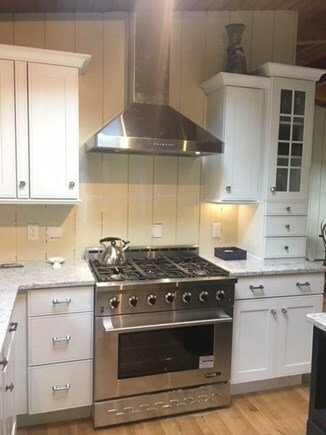 You will absolutely love the brand new kitchen, beautiful...and with every appliance, pot, pan..dishware...just so convenient. 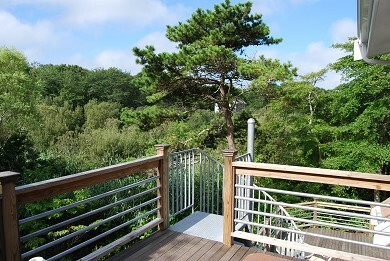 For me, the outside 2 level deck was the best part of the home...as I love the sun. Plenty of outdoor seating, dining table...coffee out on the upstairs deck every morning....cocktails down on the lower deck with my book in a lounge chair every afternoon. There were toiletries in the bathrooms, paper goods, soap and detergents for our use. Little details, big impact. We could walk to the beach in 8 minutes. I walked Racing Point Road along the beach every morning before everyone was up...beautiful. Another awesome factor was how close it was to get to downtown Falmouth. Maybe 10 minutes. We love the main drag with all the great restaurants and candy/chocolate shops, bookstore...shopping...the girls had a ball. One day we left the house at 10am to take an 11am Ferry to Martha's Vineyard. (Teenagers aren't always quite ready on time!) Too late...we couldn't park - lots were full. So, we went back to the house and took an Uber. $30.00 dollars round trip. Best $30.00 dollars spent all week. I suggest you try this to avoid the parking hassle. Was so nice to walk off the Ferry to the Uber waiting right there for us to get home after a nice day on the island. There is a lovely outdoor fire pit we used to make S'mores one night. Another highlight...the garage has four bicycles (no helmets, pack those! ), 6 beach chairs..sand toys..boogie boards..which Jim was courteous enough to let me know before I packed my car to leave home. I brought clothing. So easy. That's all you need. Before we left, my husband said "I want to buy this house." But, I am pretty sure, Jim is not selling anytime soon! We are lucky he opens it up for others to share. And we will be back there next summer, and hopefully many to come. Thank you, Jim. It was perfect. We had such a fantastic week at this beautiful Sippewissett getaway. The layout is absolutely perfect for a family with kids, as there was plenty of room for everyone to have their own space. We loved the fire pit and sat outside almost every night making s'mores. Nice little path to the beach and just a short drive from Wood Neck Beach, which is one of our favorites. The owner was wonderful - very helpful and accommodating. We'd definitely come back - thanks for a great week! Once again, a "thank you" to the owner for another positive rental experience. The house was clean and well appointed with linens, towels, etc. The gardens during the time we visited were in full bloom with blue hydrangeas. We will definitely be returning! We have spent quite a few of our vacations in this great home. It is a pleasure to come back each year! We are so comfortable here, peaceful seclusion (not another house in sight), yet right by the ocean. The home is always immaculate. Everything we need is provided with no detail missed. 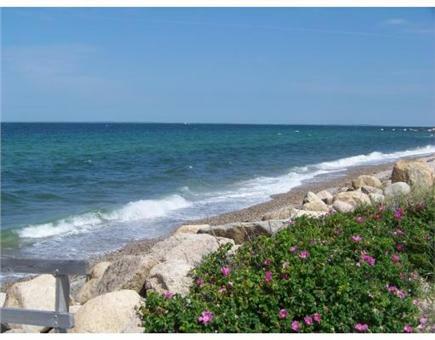 We also love being so close to our favorite spots on the Cape, Falmouth and Woods Hole, and its many good restaurants. This vacation home was very clean with lots of room. Enjoyed the outdoor deck for our early morning coffee & evening barbecues. The outdoor firepit was a hit with our boys in the evening. The short walk to the beach was enjoyable while passing the amazing osprey nest. Our first afternoon we saw an osprey flying overhead with a fish in its claws & a young one in the nest. Very cool!! We had a wonderful week in Falmouth. 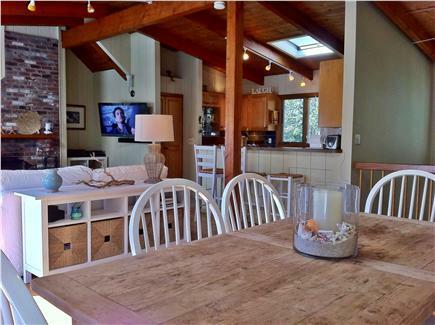 The house is perfect, roomy and private yet close to everything. The easy access to Racing Beach cannot be beat, and the sunsets there are spectacular. We took several hikes through Beebe Woods -- so fun to walk into town. I highly recommend a visit to the French Bakery. There is also a great pond for swimming with a super fun rope swing. We can't wait for a return visit next summer! Really enjoyed our week on the Cape in Falmouth! 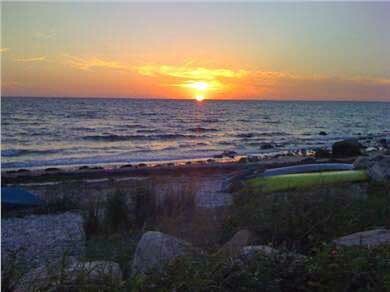 The House is just a short walk to Racing Beach, enjoyed trolling for sea glass & the Gorgous Sunsets! Easy drive to center of town & Woods Hole. The house is in a beautiful setting with great outdoor spaces & an awesome outdoor shower. Hope to come back soon! My family had a great vacation here. 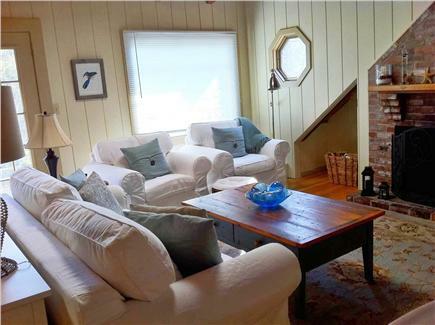 It is a delightful and under ten minute walk to the beach. The beach is peaceful with good swimming. You may want to purchase some rock shoes to wade out from shore, but well worth it and a lovely beach. The home is also very pretty, peaceful and comfortable. The driveway is a bit tricky - never back out of it - as the road is curvy and cars tend to race on it. You will love your stay at this home.